During this trip we use a range of locally owned-and-run hotels, for example in Cusco, where our chosen accommodation prioritises the purchase of local and seasonal products and produces native species in their own organic vegetable garden, which are used in their cooking. They use solar panels and energy efficient lights throughout the hotel. The practice of sourcing locally owned accommodation throughout the trip not only provides direct employment within the hotel, but also has the effect of spreading money out through the region that we visit through their support of local suppliers. We visit many towns and villages on this tour, including Lake Titicaca (home to the Uros people) and the lesser visited island of Taquile which has preserved much of its Inca and pre-Inca heritage and the islanders still speak the language of the Inca - Runa Simi or Quechua. We take our time walking across the island and we will have the chance to buy locally produced embroidery - the men's handiwork for once! The supplier that we use in Peru is a certified member of Rainforest Alliance, a growing network of farmers, foresters, communities, environmentalists and businesses that are dedicated to conserving biodiversity and ensuring sustainable livelihoods through their non-profit organisation. Our supplier is recognised for its commitment to responsible development. To help reduce the level of pollution within the city centers, the sightseeing tours we operate are mostly done on foot, which is also a great way of seeing all they have to offer first hand. Where possible we also suggest trains as an alternative to coaches. When coaches are being used for these small group trips we also keep the size of the coach to a minimum, so rather than using gas guzzling 40-50 seaters we opt for more environmental friendly 15-25 seat coaches that use less fuel and therefore emit less carbon. Guides will advise on the responsible way to hike around sensitive areas such as Machu Picchu - sticking to designated trails and helping to keep the impact of tourism in this area to a minimum. On this trip we can visit the porter's village of Misminay, which our supplier has helped through the development of the Healthy Community project. This project was developed to improve the quality of life of these families, most of whom work as porters on the Inca Trail and the Sacred Valley, by making housing improvements, setting up training events and building a water catchment gallery to improve access to clean drinking water. 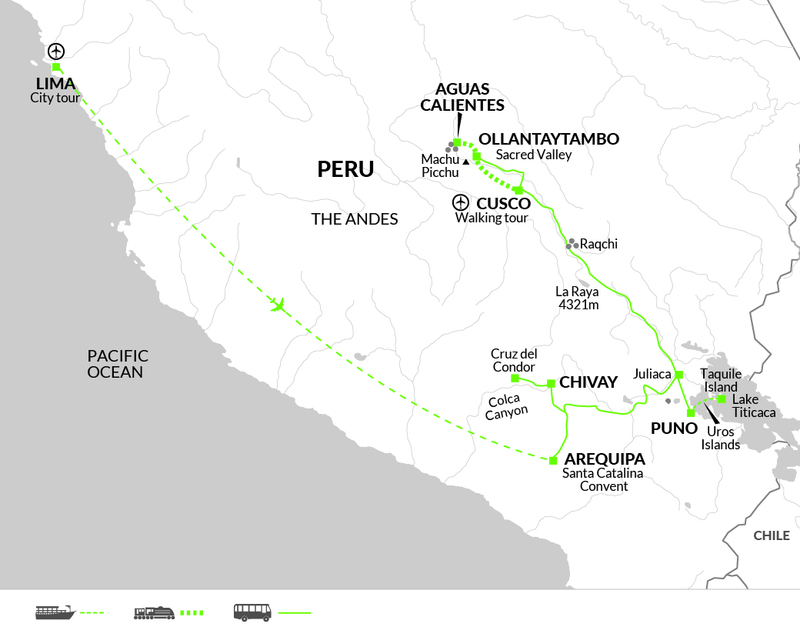 Misminay is now a key rural community tourism destination in Peru.